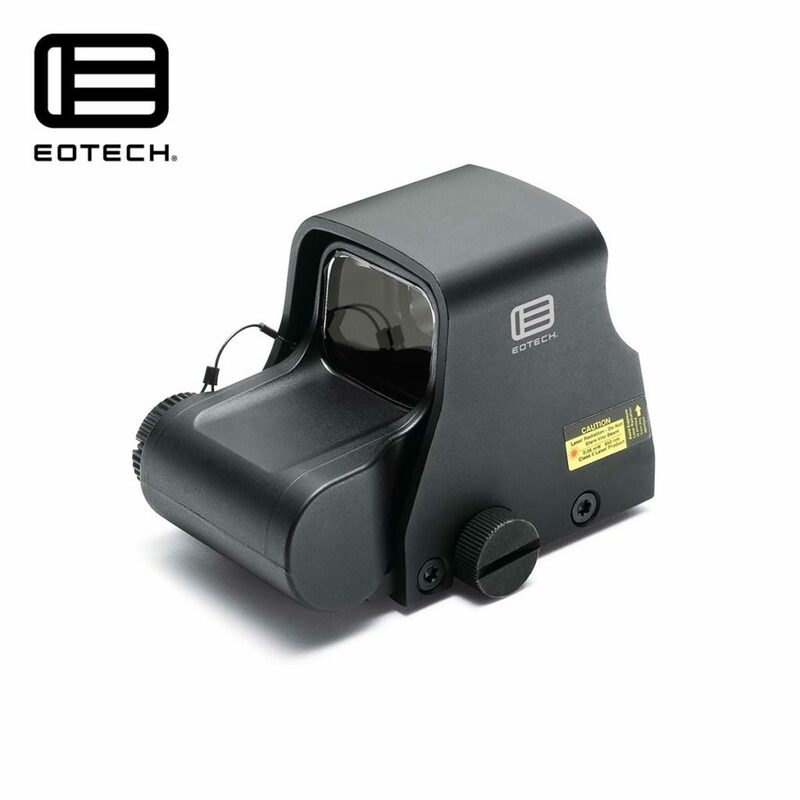 Not sure which EOTech holographic weapon sight to get? There’s a lot of models with some confusing naming conventions…we’ll help clear it all up. 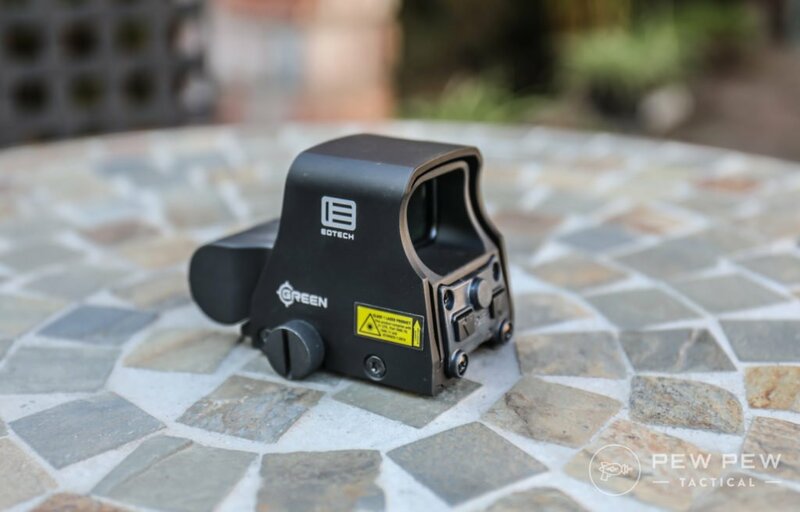 By the end you’ll know the perfect EOTech model for your end use. 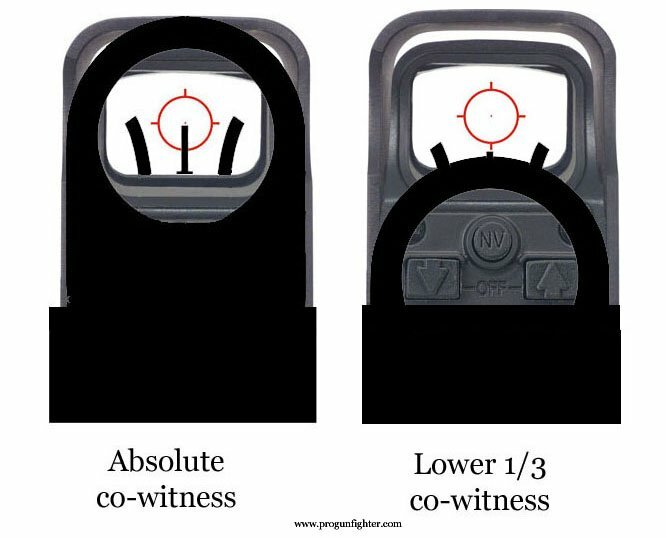 But first…if you aren’t caught up on holographic sights vs red dots sights…check out our comparison to make sure you know the pros/cons. 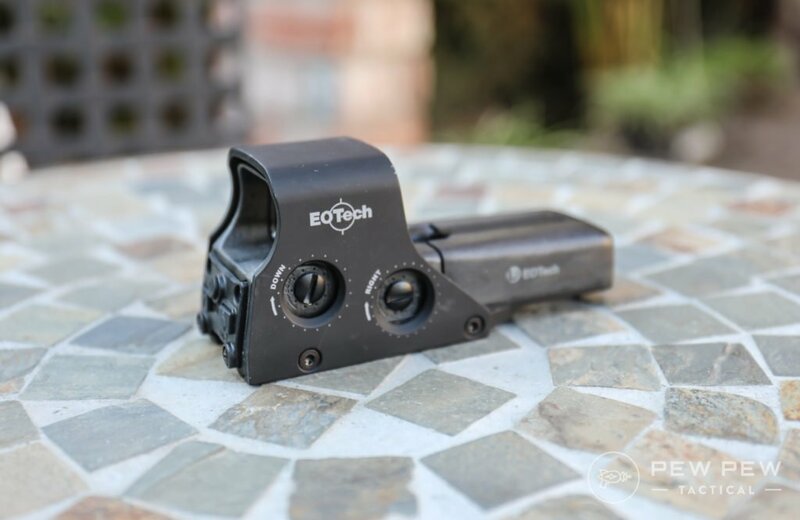 Now let’s get on with the best EOTech models! 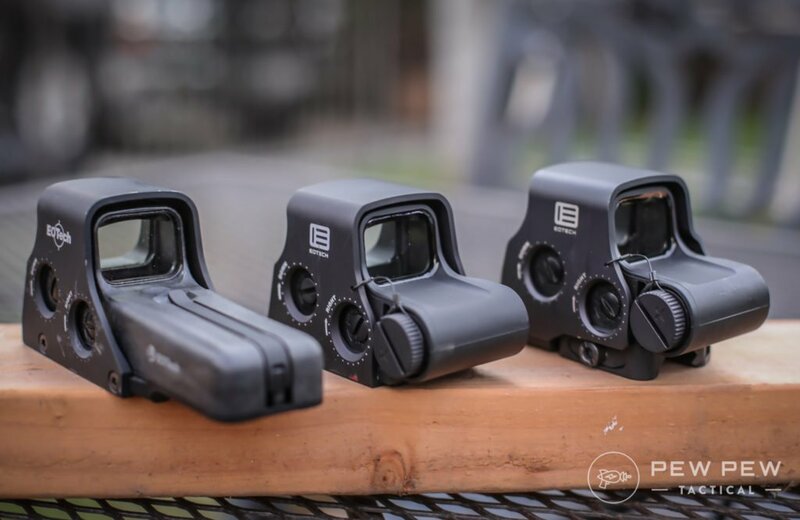 First thing is which style of EOTech…the “classic” longer model that uses 2 AA batteries…or the newer smaller model that uses 1 CR123 battery. Classics are designated with a Model # that is three digits and starts with a 5 (eg Model 512). Newer models are XPS# or EXPS# and then followed by a dash and another number (eg. XPS2-0). 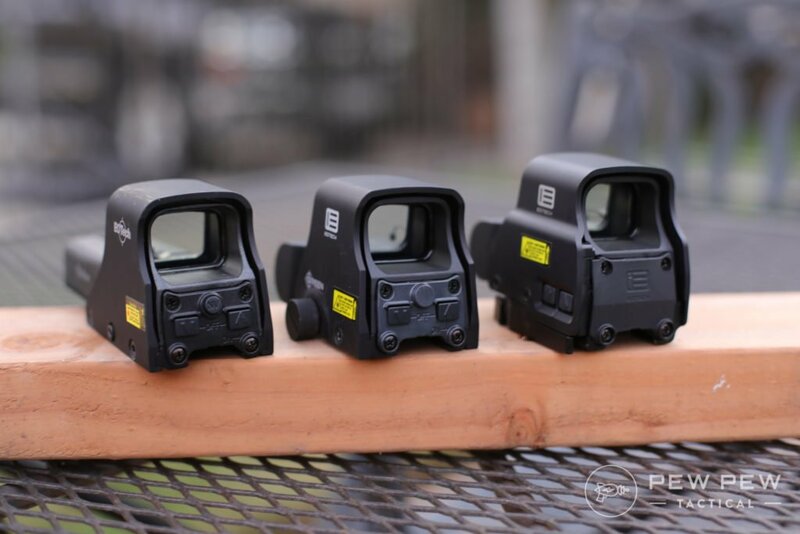 Ah…the famous EOTech reticle. I love it for its speed with its large 68 MOA circle and a precise 1 MOA center dot. It’s official designation is the model number and then a dash zero (-0)…example is EXPS2-0. When you zero the center dot at 50 yards…you get something that works for 200 yards and 7 yards. There’s also other versions but my 2nd favorite is the -2 reticle which works well with a magnifier to reach out to 500 yards. If you don’t plan on using night vision goggles…save some money and don’t get the models that have night vision mode (dimmer settings that won’t burn goggles). 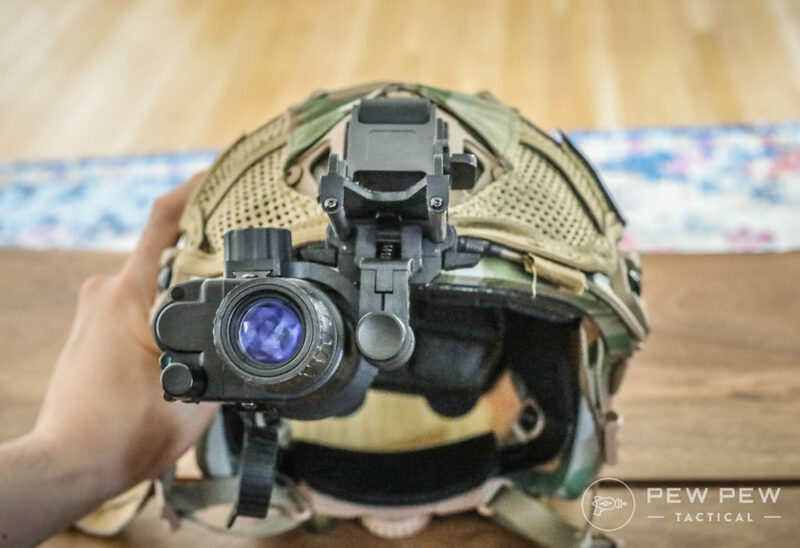 Learn more in our Best Night Vision Goggles article. There’s two options…standard with a screw or a QD (quick-disconnect) mount. The screw system weighs less (save about 2 oz) but takes longer to take on and off. And you’ll save around $25 bucks. Also…the screw system sits lower and gives you an absolute co-witness compared to the QD mount which will be lower 1/3 cowitness. If you have backup irons that you can move up and down…the choice doesn’t really matter that much. But if you are running fixed irons…I prefer the lower 1/3 so the front post doesn’t get in your way all the time. Plus the height matches up better with most common magnifiers. Check out our favorite ones. 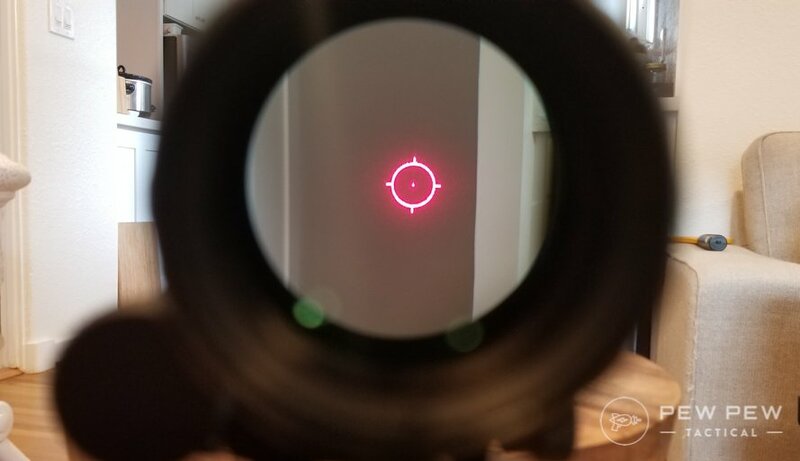 Here is the reticle behind a 3x magnifier. Lastly…the QD mount versions (EXPS) have the buttons on the side which make it easier for manipulation if you have a magnifier behind your optic. Even without irons…I prefer the QD mount version since I tend to move my optics around a lot and have gotten used to the buttons on the side. My favorite pick and what I run on my competition PCC rifle (Best Pistol Caliber Carbines) is the EXPS2-0 ($490). 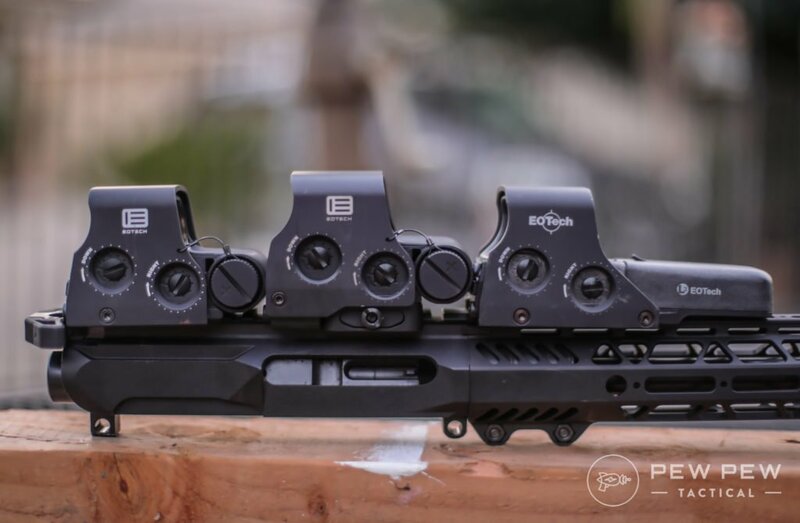 Not as heavy, easy to take on and off while maintaining zero, able to easily accept a magnifier because the buttons are on the side, and comes with the fast standard reticle. What’s your take on the EXPS2-0? 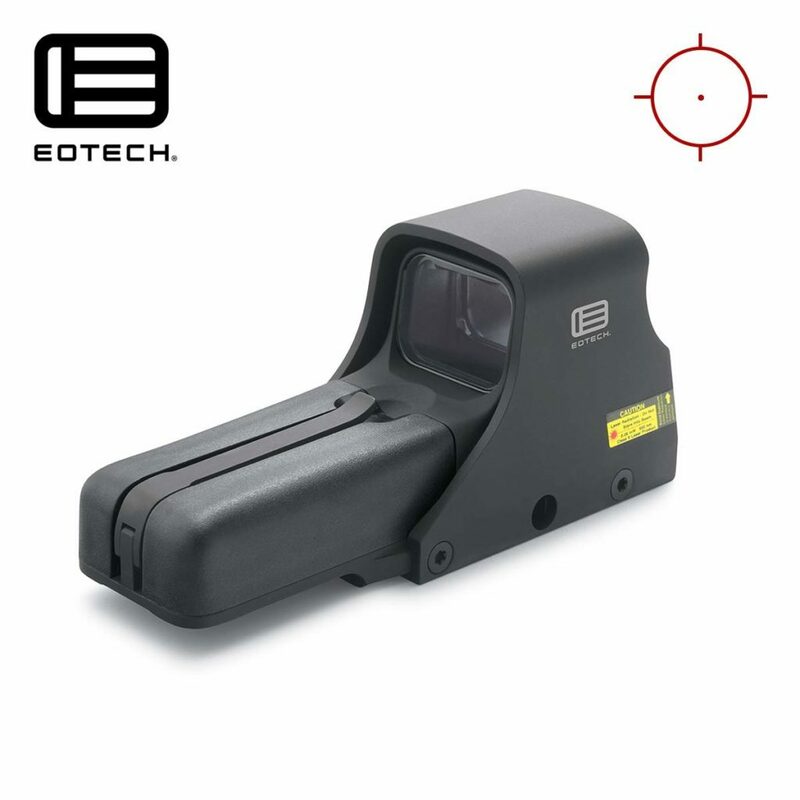 My entry-level pick if you want to enter the world of holographic weapon sights is also EOTech’s best-seller….the Model 512 ($376). No frills if you don’t mind a few more ounces with the classic design and a slower screw mount. But if you don’t plan on moving around your optic, that last point doesn’t matter that much. We go back to the newer/smaller design and go with the screw mount system on the XPS2-0 ($470). What I would get to save a few ounces but don’t need to magnify or quick-detach. If you need night vision capability…go with the EXPS3-0 ($585). I recommend going with the short model for night vision so you save rail space in case you need to mount around your optic. Want the fastest acquisition speed? 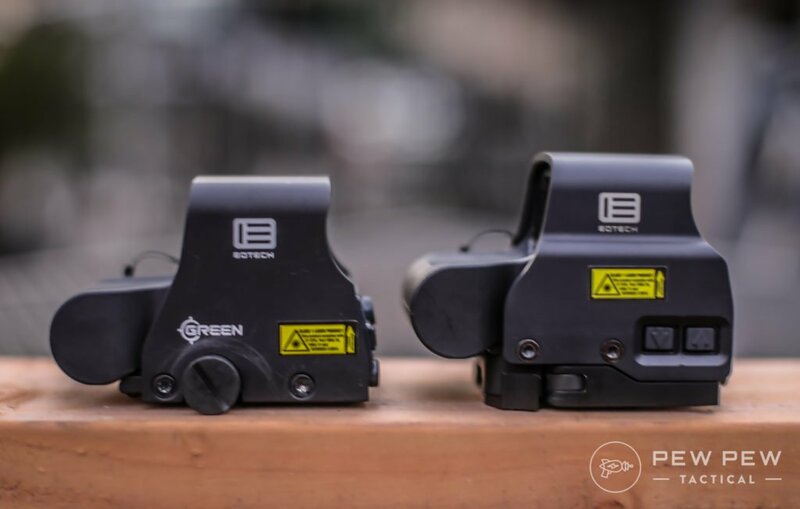 You’ll want EOTech’s new green reticle optics since green is supposedly picked up 6x faster by the human eye. I have the XPS2-0 to test out the screw mount system…but I’d instead recommend the EXPS2 QD version ($669). Keep in mind that green is great if your lighting conditions are constant (like competitions). But if you might be clearing a first floor and then entering a basement…you’ll want to stick with red. 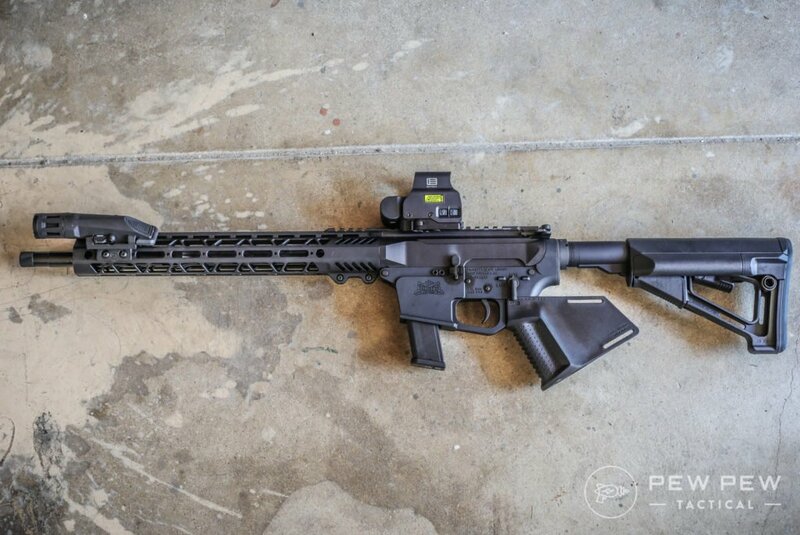 Looking to have the highest quality 3x magnifier plus your regular EOTech? Take a look at the HHS Hybrid models ($900). 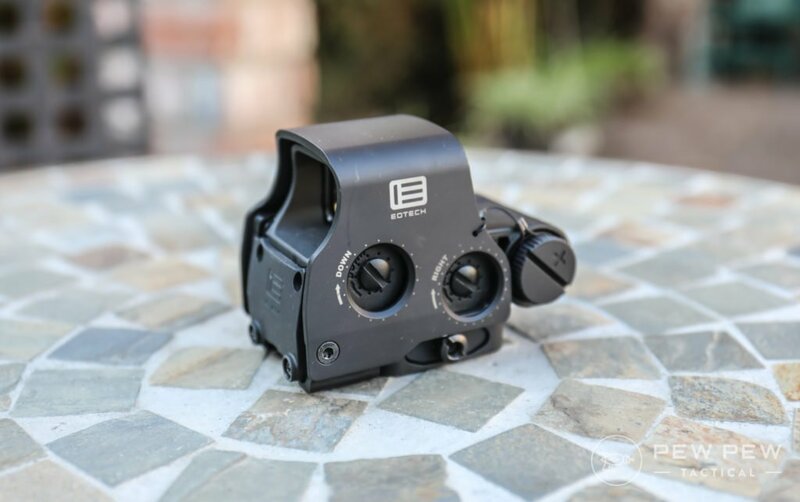 We go over our favorite 3x Magnifiers Under $200 but EOTech’s are in a class of their own with clarity and flip-mount. 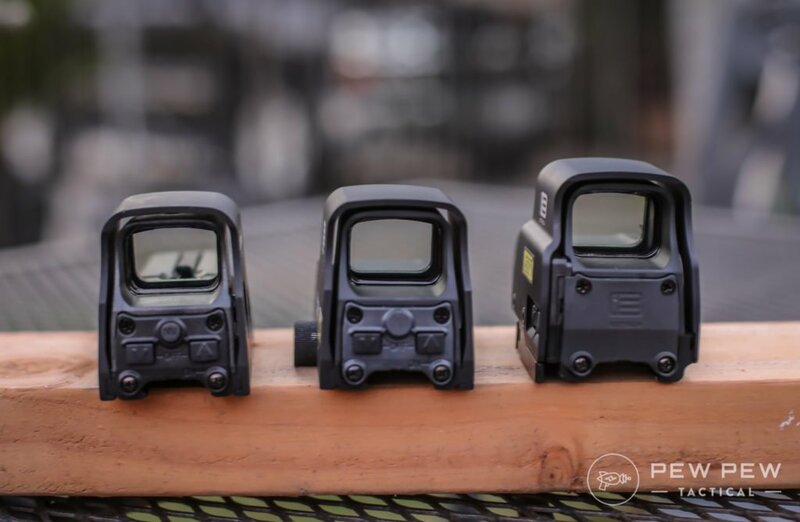 There you have it…my favorite EOTech models. 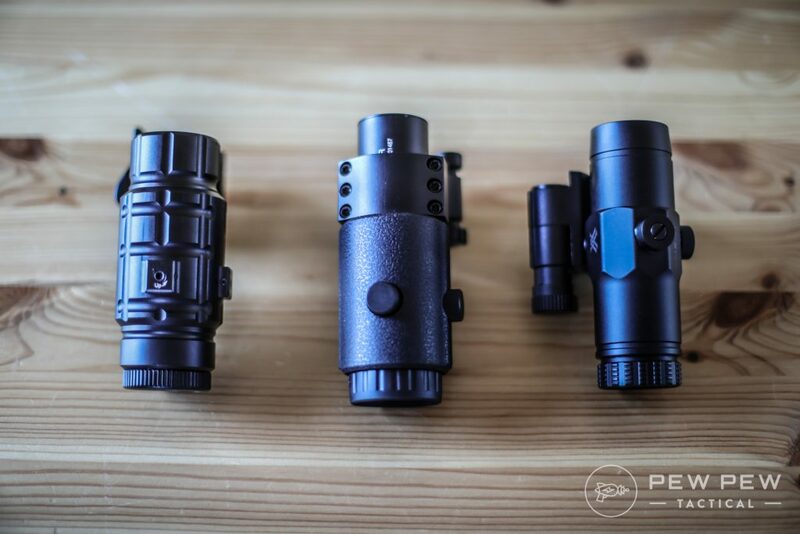 Again…if you’re still stuck between choosing a red dot or holographic…check out our comparison article. If holo sounds right…my top pick is the EXPS2-0. And my most affordable pick is the Model 512 that takes AA batteries. 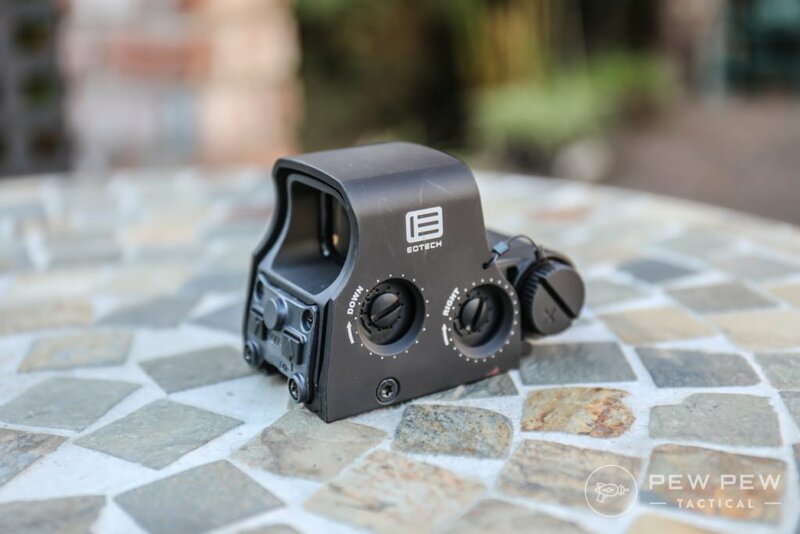 Did you end up choosing a favorite EOTech? Let us know in the comments. Looking at red dots or magnified options? 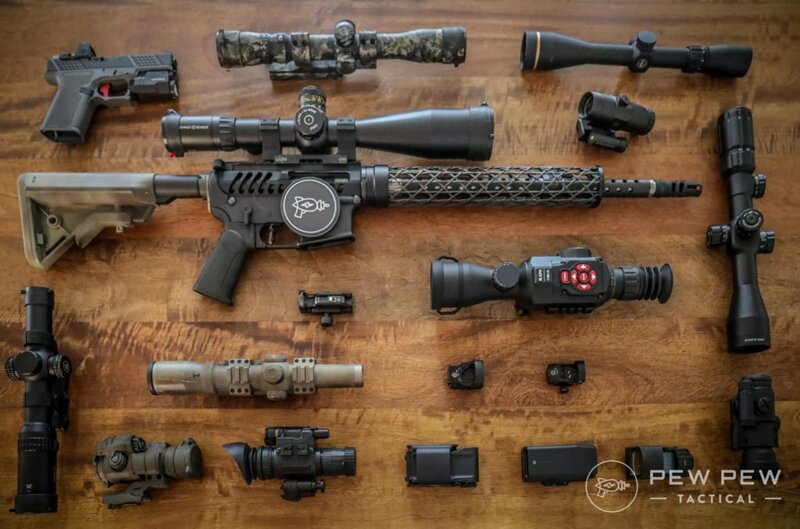 Check out our super comprehensive Best AR-15 Scopes & Optics article. I have to throw this out there. 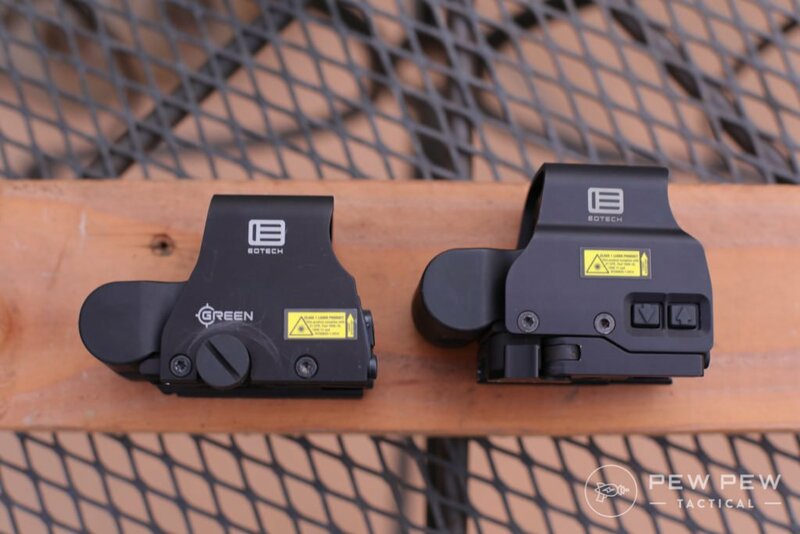 For people with astigmatism, you might want to try out someone’s Eotech before you buy one. 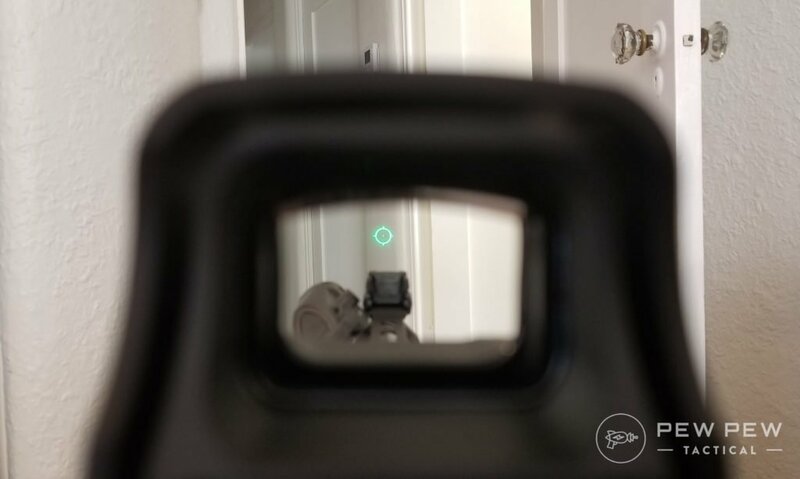 The way the EOTech’s reticle is formed are by using thousands of individual dots of light, which all become ghosted and star-bursted for people who have significant astigmatism. As much as I love my 512, it’s simply isn’t practical for me. A Prismatic Optic might be a better choice for those like me. If you have astigmatism even a simple red dot while starburst on you. 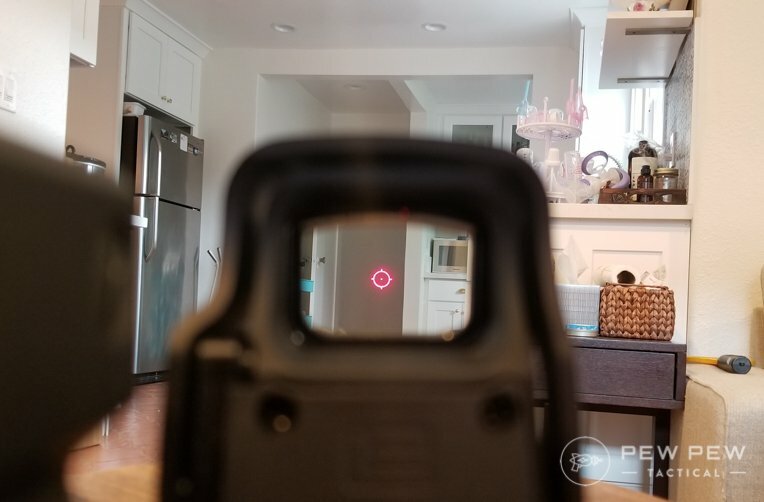 It is worse with the Eotech because the 68 MOA circle is made up of individual dots so all of them will starburst making it a mess, like a big fuzzy cherry. Glasses will fix the issue for both. 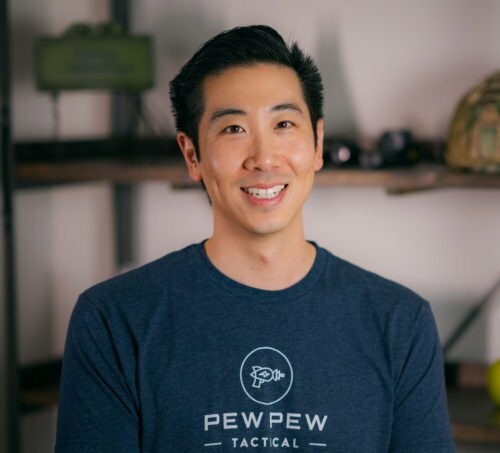 I have very light astigmatism and I’ve found EOTechs do a little better than red dots. Be sure to check! And like Larry said…it goes away with correct prescription. Leupold Lco is best for astigmatism. 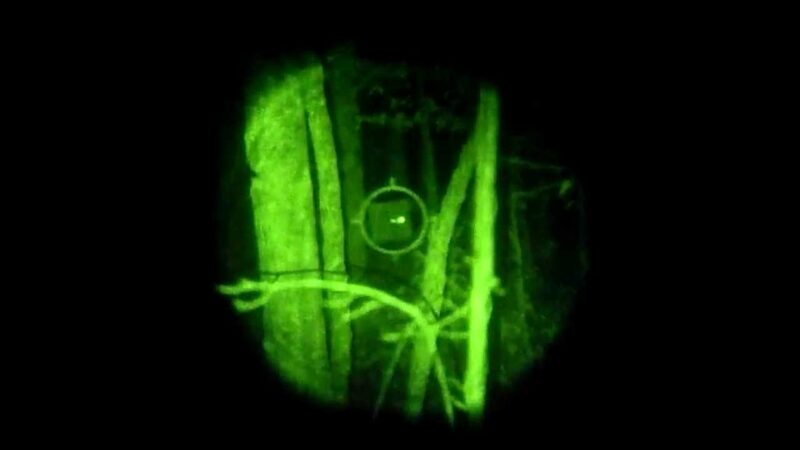 Update: check out our Best Night Vision Goggles article!